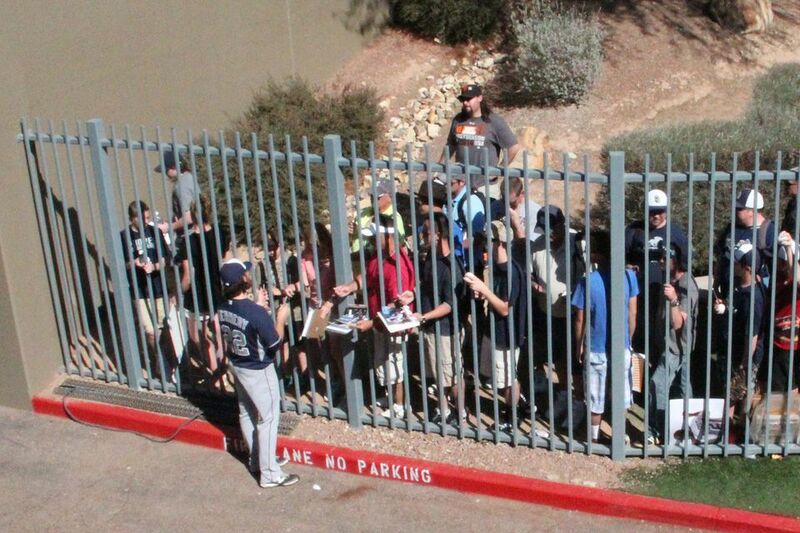 One of the most popular activities during the Spring Training season in Arizona is getting autographs. Cactus League Baseball is exhibition baseball; the stadiums are smaller, and the ball players are generally more accessible. Because there are 15 teams that play in the Cactus League for more than a month there is never a better time to see many of your favorite ball players up close and personal. Some major league players, past and present, live in Arizona all year round. Wouldn't you like to get Joe Garagiola's autograph, or Ryne Sandberg's? How about Harmon Killebrew's or Robin Yount's? Who knows--maybe you'll run into them this season. At practice sessions. For about two weeks before the Spring Training Season starts the players report and start practicing. Those Cactus League practice sessions take place on practice fields at or near the team's Spring Training stadium. As players and coaches come and go, to and from practice fields, you can often get autographs. At Baseball City. In early March you can attend an outdoor, free festival for Cactus League lovers. One of the attractions there is that there are autograph sessions, and some Meet & Greet sessions, in addition to regular spring training. At Spring Training games. Most stadiums open at least an hour before game time, and players will warm up on the field and walk to their dugouts. You can try to get autographs at the players entrance at the stadium, or from behind the dugouts on the field. After the game, you can hang around and try to get some autographs as they are leaving the stadium, too. At Salt River Fields in Scottsdale (Dbacks and Rockies) you may ask players for autographs along the railings up until 40 minutes prior to game time, or until the end of batting practice. At restaurants and bars. Alice Cooperstown in downtown Phoenix is owned by Alice Cooper and others including Randy Johnson. This is a popular spot for ballplayers and fans alike to congregate for some barbecue. Don and Charlie's in Scottsdale is where ballplayers (or anyone else!) goes when they want ribs. Even if you don't get an autograph, you'll enjoy the sports memorabilia. Diamond's Sports Grill in Mesa is one of the most popular places to go after a Cubs game. Cubs fans are very familiar with this spot originally owned by Harry Caray and Steve Stone. It used to be "Harry and Steve's Chicago Grill." There are other great sports bars around town where you can watch Cactus League games on TV, and maybe even see a ballplayer after the game. Yes, We Have Pro Soccer in Phoenix!